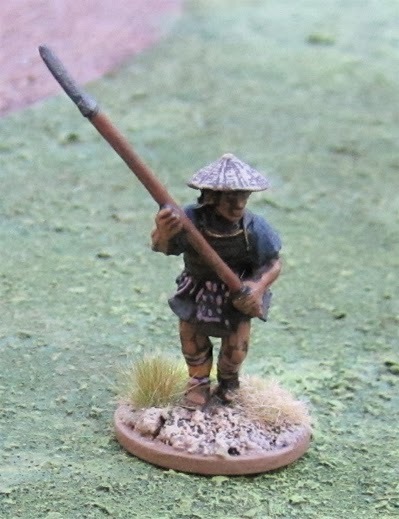 Here are an odd assortment of items I’ve been working on over the last week or so… There are a few other items I’ve finished up (members of the various Ronin Buntai), but I thought I’d leave them for when I have entire Buntai finished. 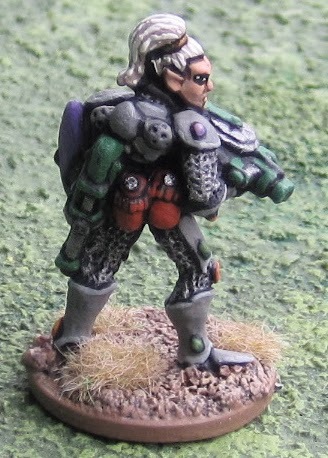 An old Rogue Trader era Eldar Guardian from Games Workshop. 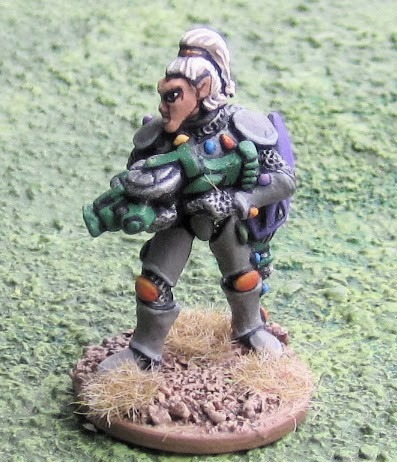 He is © and ™ Games Workshop (though technically I believe it was Citadel Miniatures at the time) and painted by myself and posted here entirely without their permission. At some point I thought I’d run an Only War or Rogue Trader campaign for the kids and I thought it’d be fun to have a recurring band of Eldar that pop into situations sometimes thwarting them, other times aiding them, always acting on their own bewildering agendas which will likely make no sense to the players at the time, but may be hinted as later in the campaign. 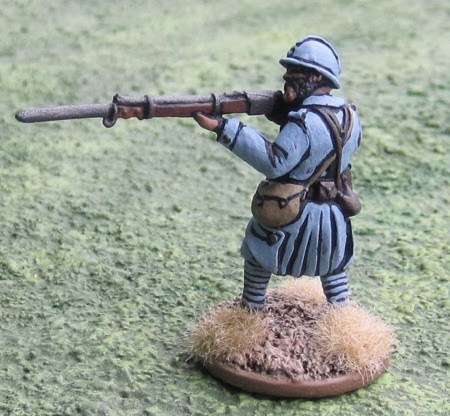 A later Great War French Poilu from FG MiniZ/Forgotten Glorious. A while back they’d offered to send a free sample to anyone who asked. 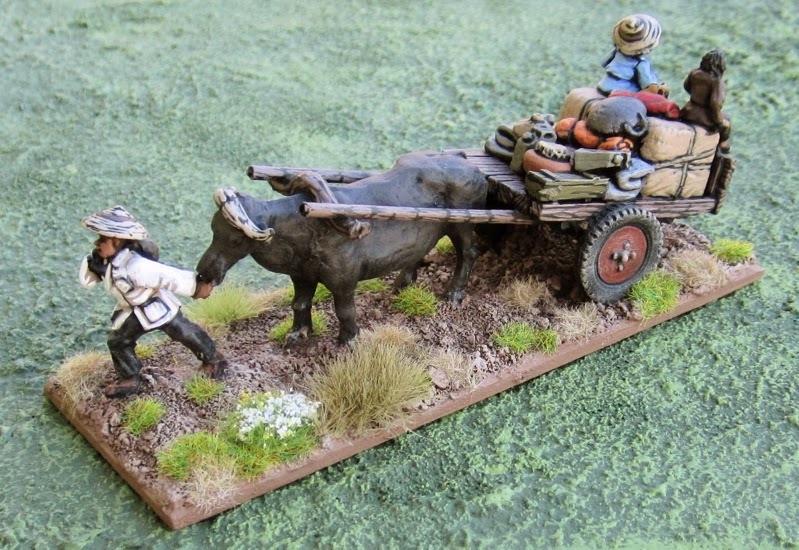 The have 1806 Prussians and some American Civil War miniatures – which I’m not particularly interested in – but they also have 1917 French – and the Great War IS something I’m interested in, so I asked for a sample from that line, and the miniature above it what they sent me. 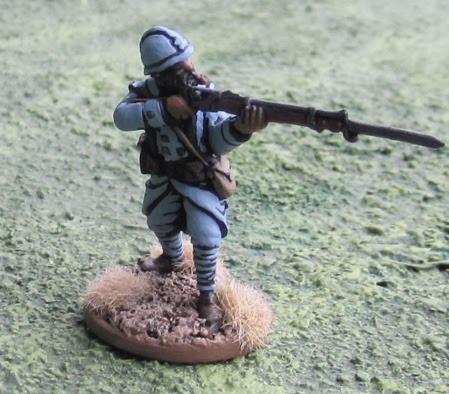 Now, I have no other Late War French… so there wasn’t any really need to paint this straight away, but I figured if they were nice enough to send along a mini, I thought I’d paint it up and show it off for them. 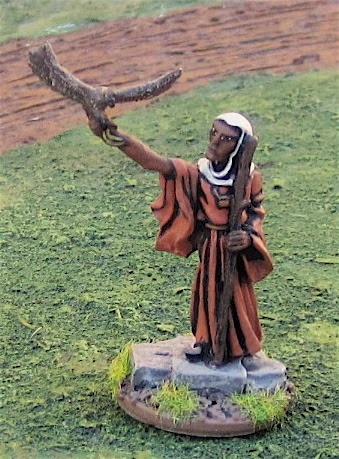 This is another batch of Black Hat Miniatures peasants - so I now have 15 of them! 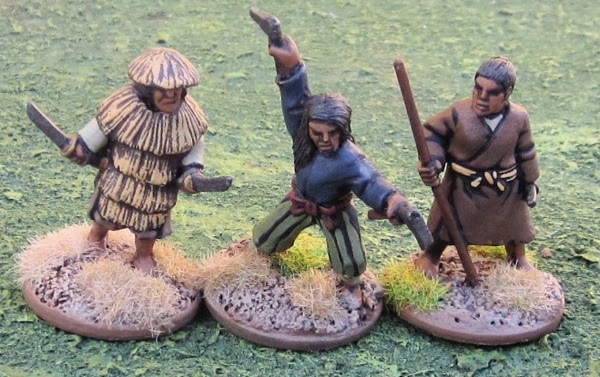 Three more Peasants from The Assault Group - though the one with the sword looks less like a peasant to me and more like a down-on-his-luck ronin. These as with the Black Hat Peasants above will be going in my Peasant Buntai. 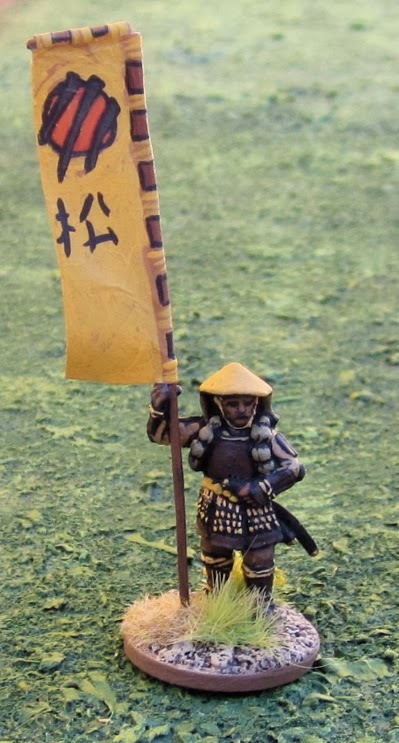 Two Perry Miniatures Samurai for my Ikko-Ikki Buntai. 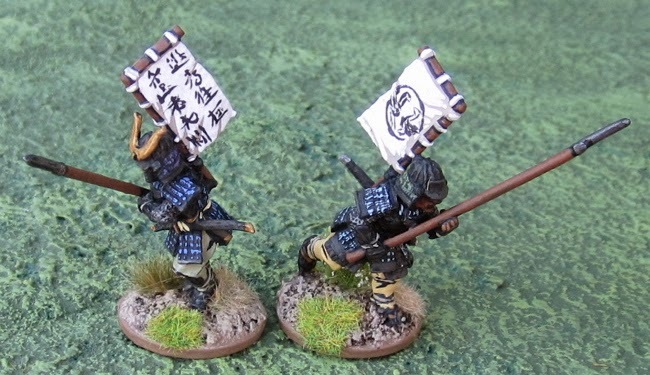 The banners are Ikko-Ikki banner that I found illustrations of in the Osprey book on Warrior Monks. 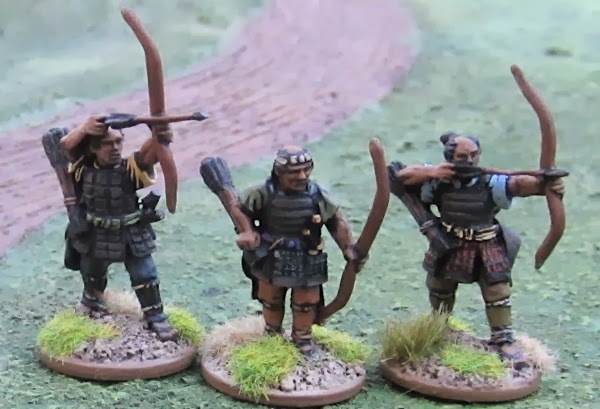 The remaining Ashigaru archers from the Perry Miniatures pack I used to convert three of to Monk Archers - these will also be adding to the ranks of the Ikko-Ikki Buntai! It was like Xmas around here today! 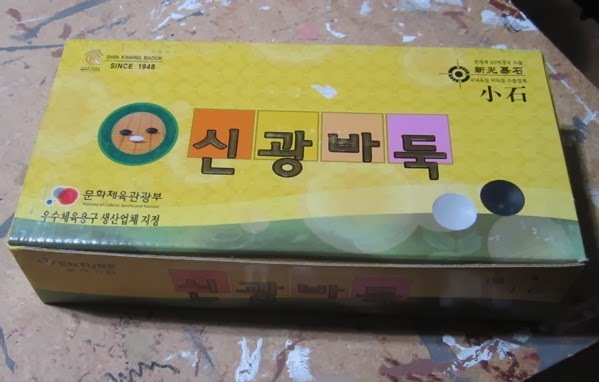 Three parcels arrived in the mail (well... four actually... but only three are relevant to this blog...). 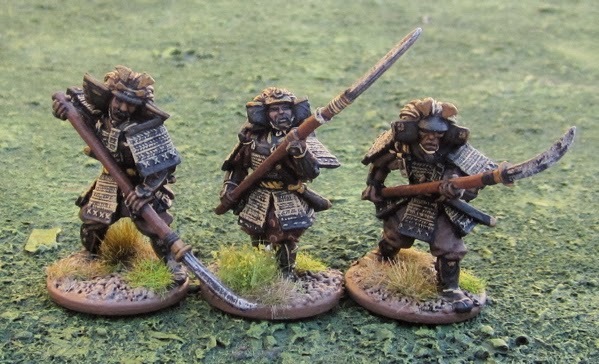 The Ronin campaign that we will be tha main event of the 10th Annual Wargaming Birthday Bash/Winter Wargaming Weekend is less than FOUR WEEKS AWAY! So here’s a little progress report…. 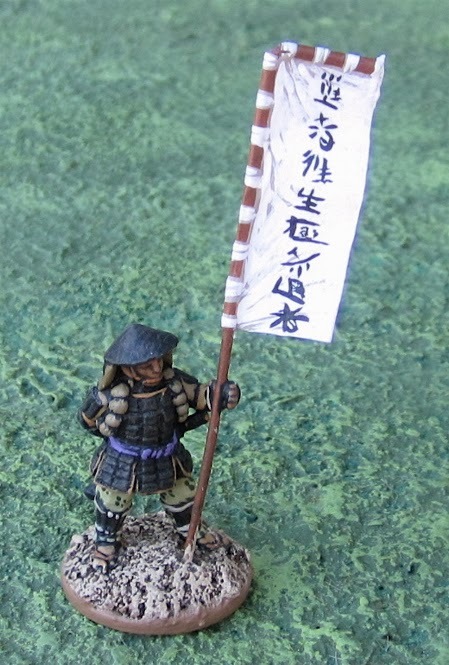 The remaining five are a second Sohei Buntai and four more Bushi Buntai (Dragon, Crab, Crane, and Phoenix Clans). Two are half done and I hope to finish them up within the week. Then if I completed one a week for the remaining three weeks I’d be good to go. 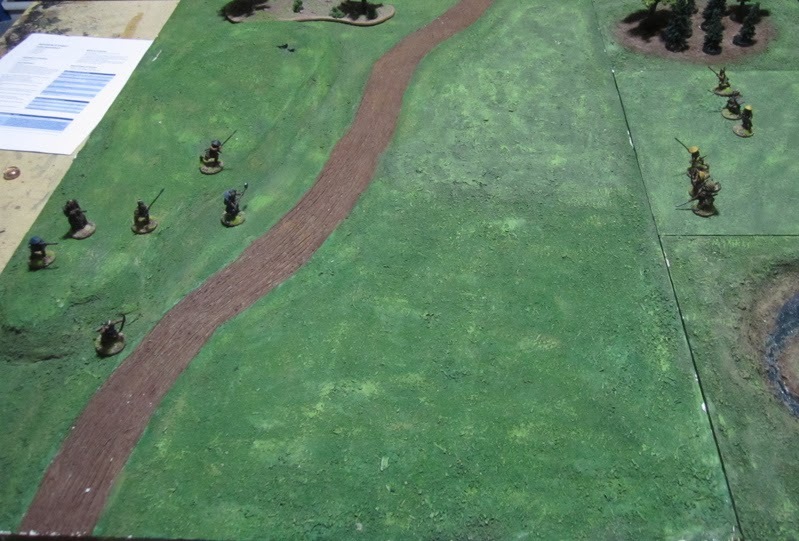 I’d like to build a few more terrain bits to go on the game boards… we’ll have to wait and see. 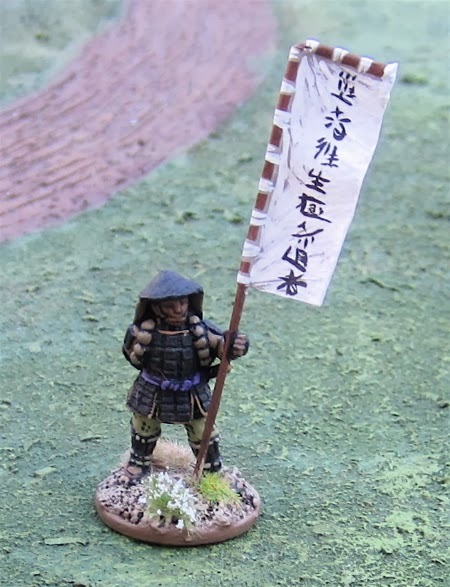 Yet another buntai for Ronin – Skirmish Wargames in the Age of the Samurai that we will be using in the 10th Annual Wargaming Birthday Bash/Winter Wargaming Weekend. 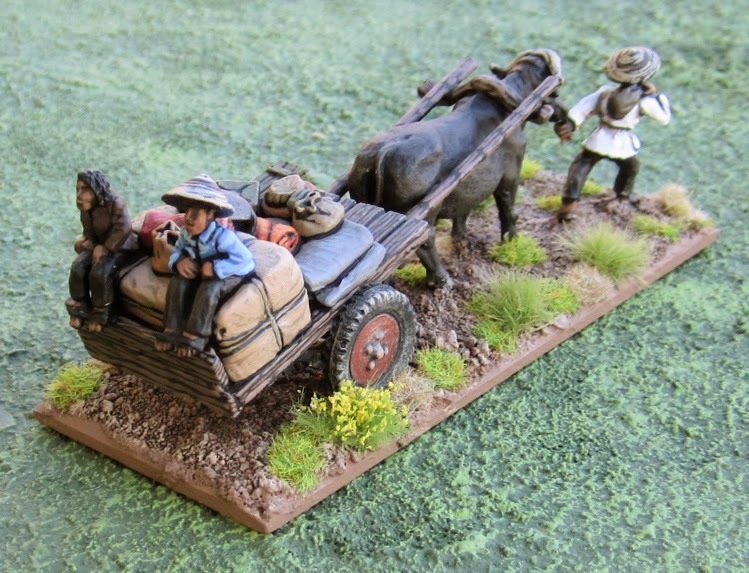 All of the miniatures in this buntai are from Perry Miniatures. 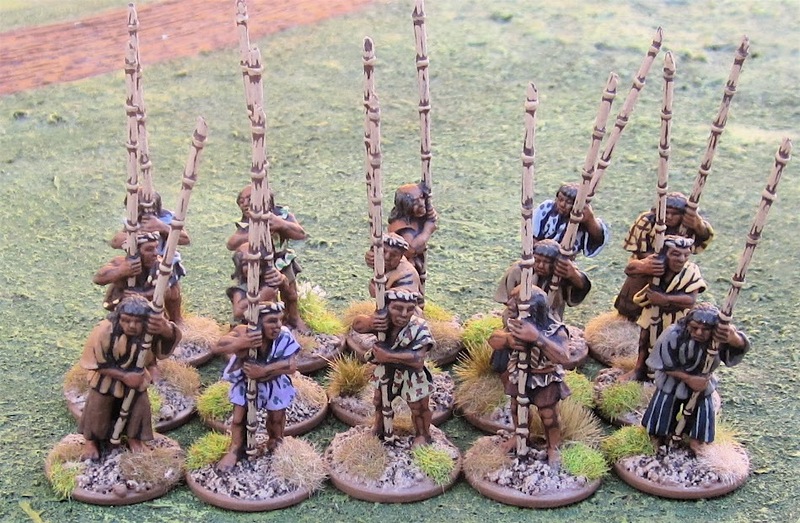 (The full 400 point force will actually have TWO Monto-Gashira with Banner – but they will only ever be fielded one at a time, so I only have the one miniature). I'm not sure how they will work out. After Last Week's Game between the Bandit and Bushi buntais I'm thinking this may not be too bad. The peasants are completely ineffective on their own - but their sheer numbers (bolstered by a few Ronin) could be pretty effective...? We'll have to give them a try out sometime this week. 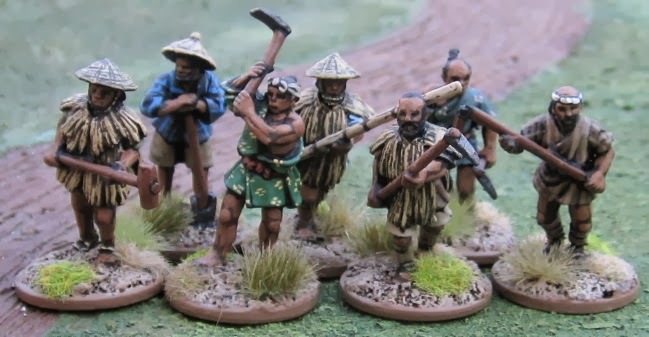 The majority of the Peasants (the ones with the sharpened bamboo poles) are all from Black Hat Miniatures, the remainder (below) are from The Assault Group. 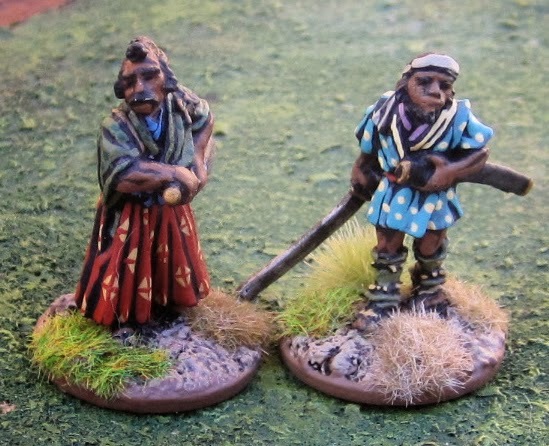 At least 30% of a peasant buntais points must be spent on peasants – the rest are spent on Swords for Hire. 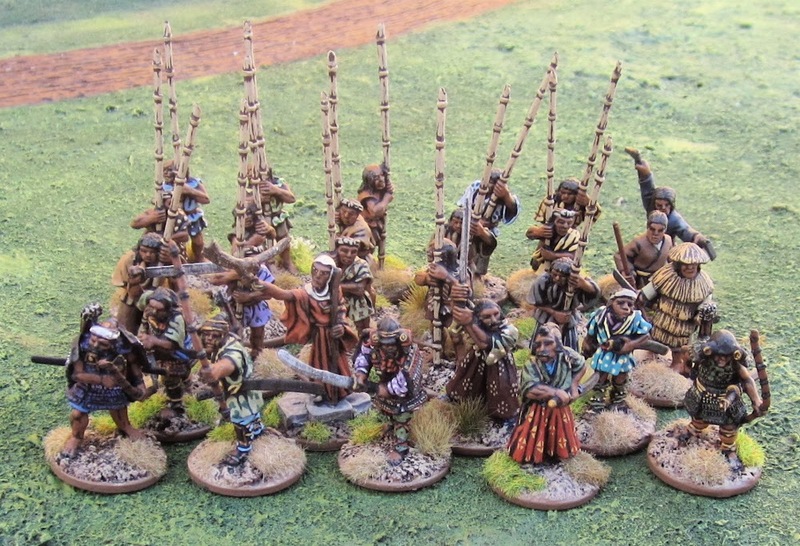 I don’t actually HAVE 36 peasants I just have the 18 shown here – as we will only be fielding 150 point buntais for scenarios I highly doubt there would even need to be more than 12-15 on the table. 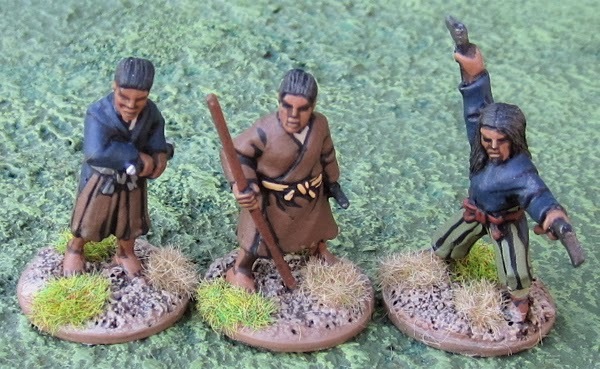 All of the Ronin below are from Black Hat Miniatures, the Monk is from RAFM. 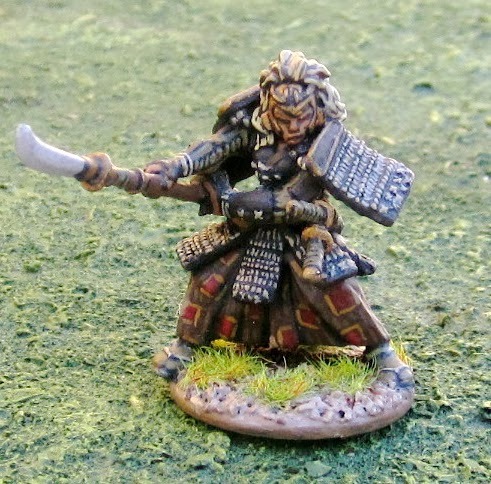 The miniature is from AEG’s Legends of the Five Rings: Clan War line. 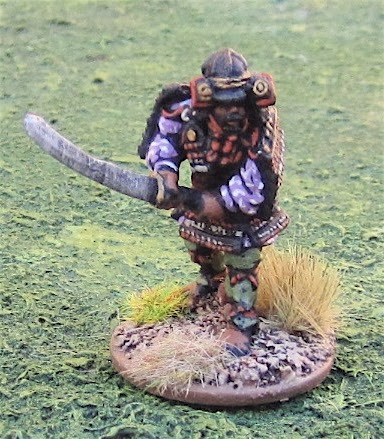 I believe the Miniature is supposed to be Matsu Tsuko, who became Daimyo of the lion Clan after the disgrace of Akodo Totori. 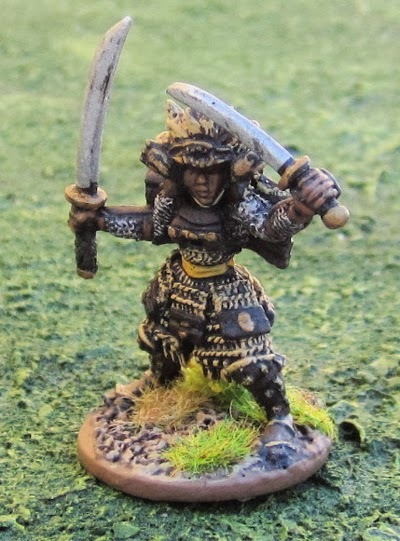 This miniature is also from AEG’s Legends of the Five Rings: Clan War line. 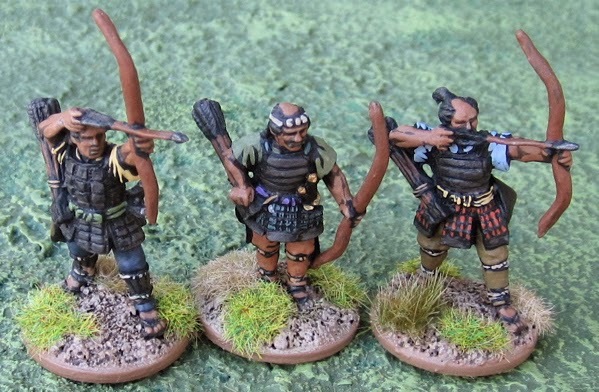 Again, all three miniatures are from AEG’s Legends of the Five Rings: Clan War line. 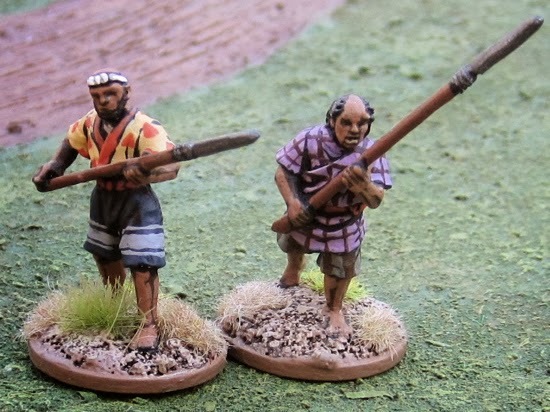 The archer on the right is from Old Glory, The gunner with the teppo on the left is from Perry Miniatures. 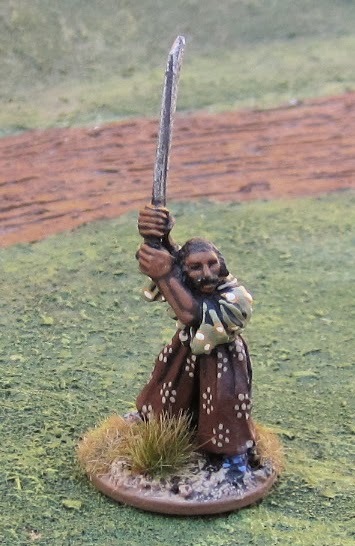 This figure is actually a Perry Miniatures Spearman that I made my own banner and pole for. 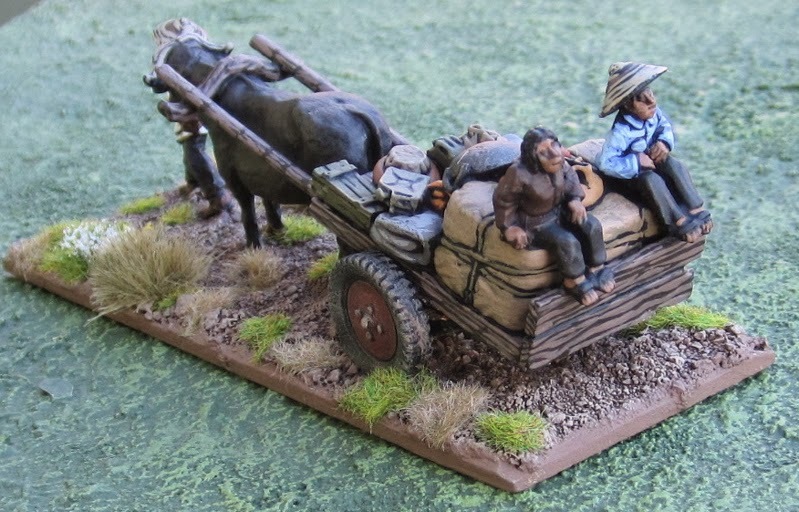 A few months back I was trying to finish up my 28mm Vietnam War stuff – and pretty much got it all done… except this…. I assembled it at the time, but it looked like too much work… and so it sat….until this past week when I decided to finish it up – not only to have it finished up and be one step closer to being DONE all the 28mm Vietnam War stuff that I have – but also because it happened to be another theme bonus round in the Fourth Annual Analogue Hobbies Painting Challenge and the theme was VEHICLE! 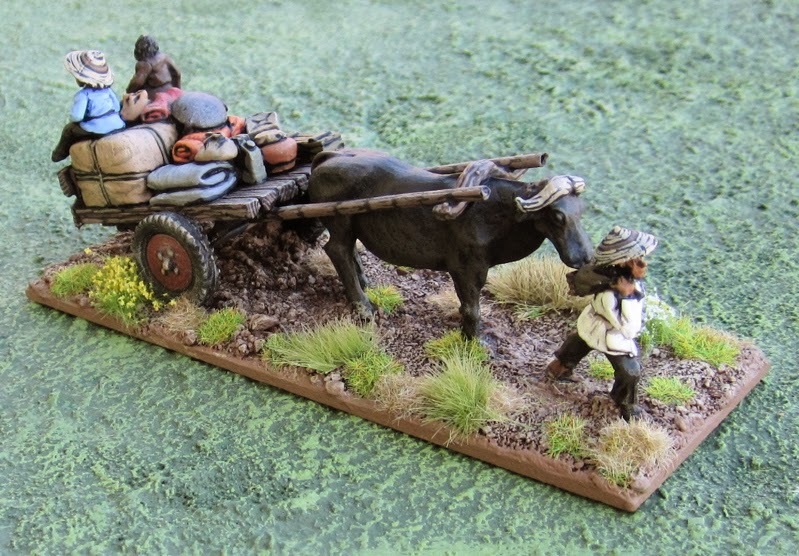 The model is from Baker Company. Force on Force has rules for civilians on the battlefield – any live of fire drawn with in a certain distance of a crowd of civilians has a chance of hitting them – and losing the shooter some victory points. This would work perfectly for that! I’m down near the bottom of the list! It probably won’t help I’m WAY behind – There are a lot of great entries… maybe while you’re there check out (and maybe vote for!) PhilH’s “Pulp Café Racer” – it’s a sweet looking early motorbike and rider and it’s one of my absolute favourites and it has less votes than mine!? Hmmmmm… I’ve been working on a bit of this and a bit of that… having a hard time staying focused and motivated. Hopefully this week I’ll finish up another buntai or two. 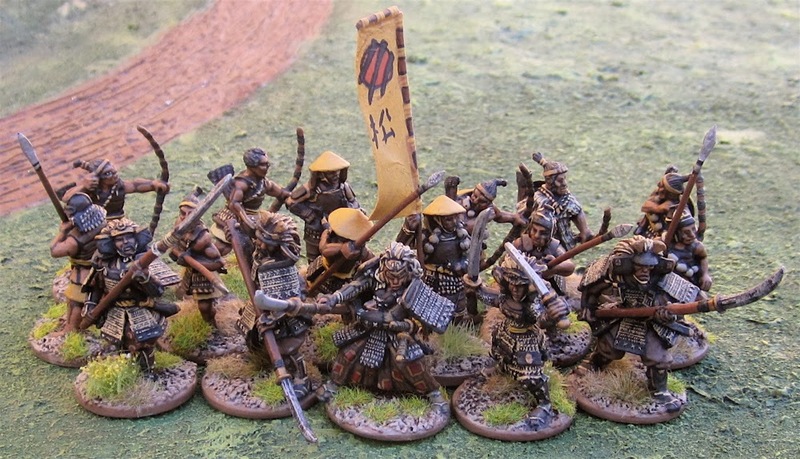 I got in two more games of Ronin – Skirmish Wargames in the Age of the Samurai this weekend. One on Friday night and one on Satruday night. Friday Night Christian came into town with his girls and played a game with my kids. We played the Skirmish Scenario. I can’t remember what the minor objectives were. I think we rolled TWELVE turns for the game length! 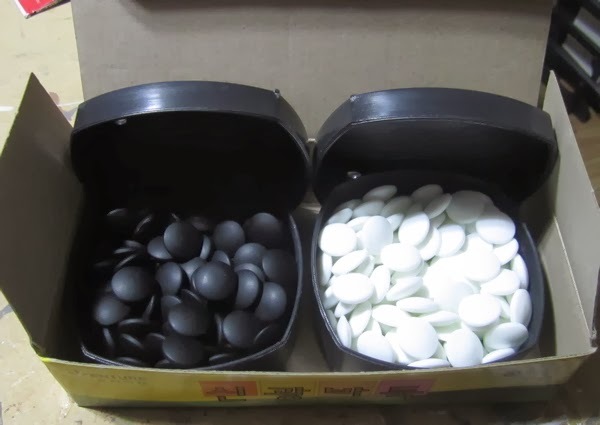 Both side were pretty much identical – both had a Bushou and a Samurai and four Ashigaru (two with Yari, one with Yumi, one with teppo) – so each of the kids got to play the buntai’s Bushou or Samurai and two Ashigaru. Christian and his girls against my kids. End of Turn One – the Lion cland charges forward together… mostly… The Crabs seem a little out of sorts – not so determined to rush into combat. 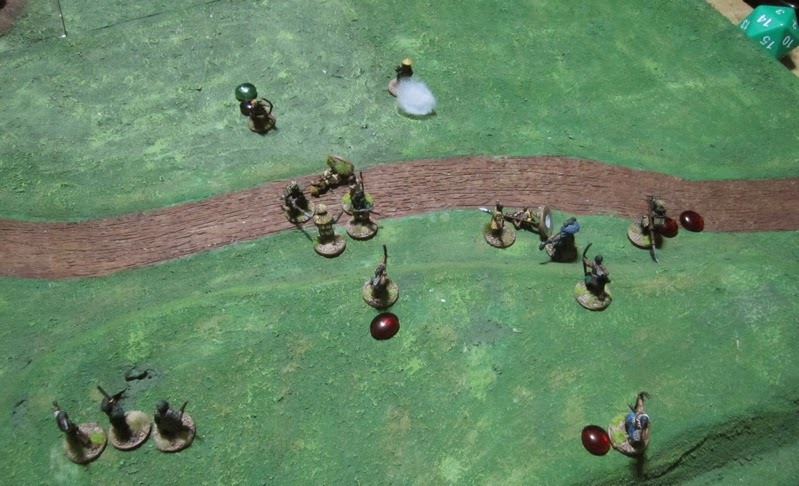 End of Turn Two – the Lions have formed a battle line and let fly with a shot from their teppo… harming no one.. Turn Three - The Crab clan finally gets it’s act together and forms up a battle line. The Crab Teppo fired, The lion clan teppo reloads. The archers have been firing all along but with little effect. The end of the Turn Four – not looking good for the Crab clan – Two of their number are lightly wounded and another stunned, whereas they only managed to stun one of the Lion Clan. 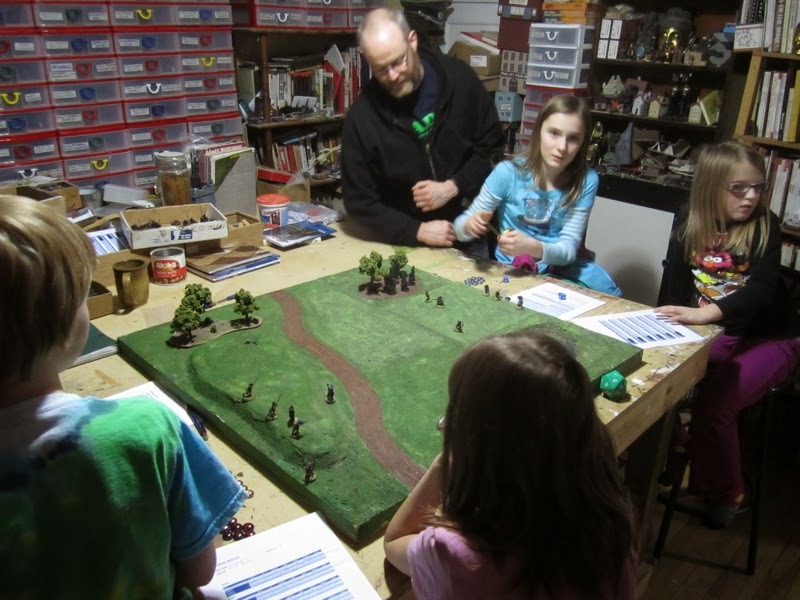 Turn Five – the battle rages on! Finally the Lion archer hit the Crab teppo gunner. 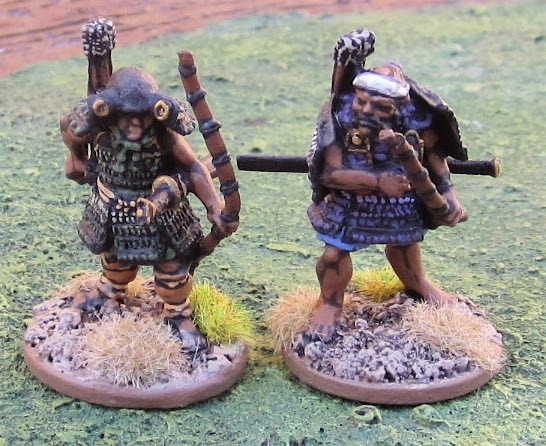 Two of the Ashigaru stabbed each other with their yari – the Lion ashigaru taking a grievous wound! And some more stunning going on. Turn Six – the last turn we played before the Lion Clan had to pack it in – The lion archer is hit and wounded (I think by the Crab archer). The grievously wounded Lion Ashigaru is finished off, but the Crab Bushou is Grievously Wounded! A fun game – I think we’re all getting the hang of this. Saturday night Rick, Dave and Patrick showed up. Patrick and I played some bandits against Rick and Dave’s Bushi Buntai. Again we played a skirmish scenario. The Bushi had to capture a figure of rank two or higher. The game was to last 7 turns. 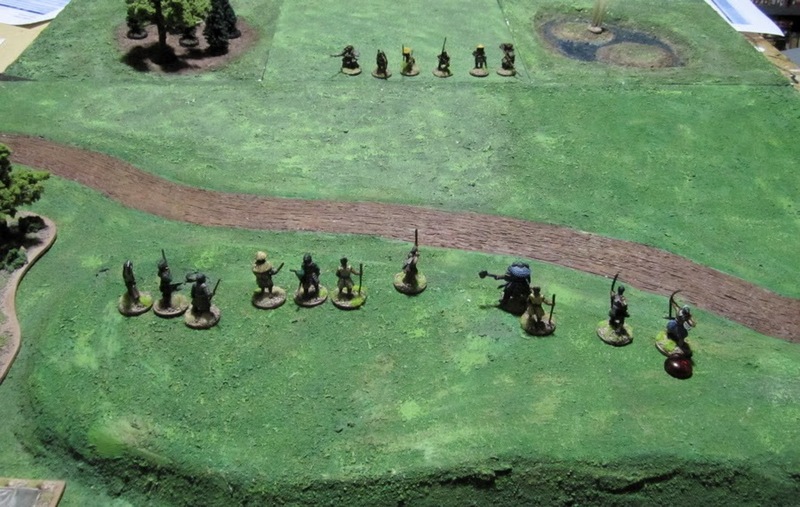 Turn One –The bandits line up on the hill, the Lions charge at full speed to close the distance as fast as they can! Arrows were fired but missed wildly. 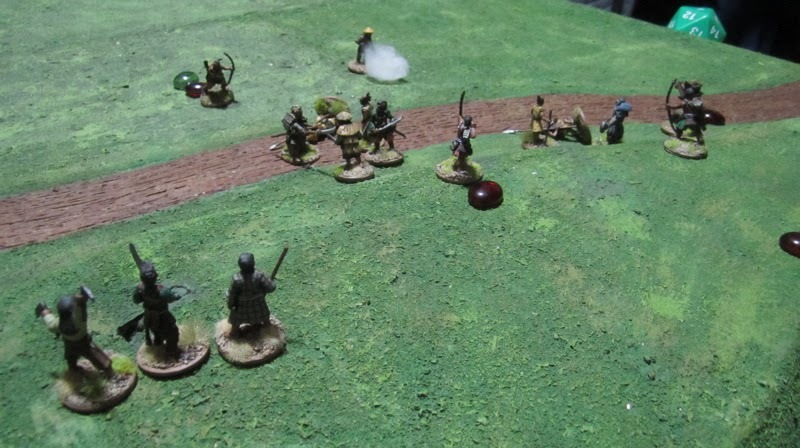 Turn Two – The Lions surged forward, the bandits held their ground – the archery was a bit more telling this round – One of the lion Ashigaru was lightly wounded, another was grievously wounded! 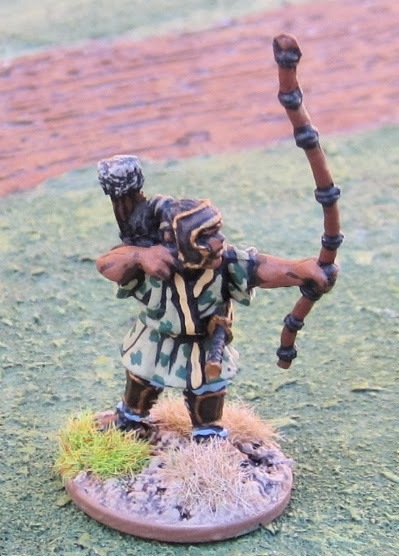 The bandit gashira archer was also lightly wounded. Turn Three – The Lions continued to charge forward a full speed. 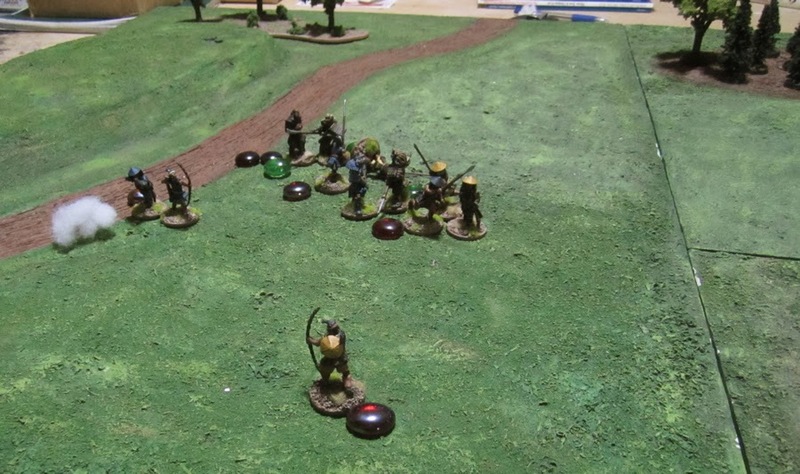 A few of the bandits came down off the hill to meet a few of the Ashigaru – killing two of them. 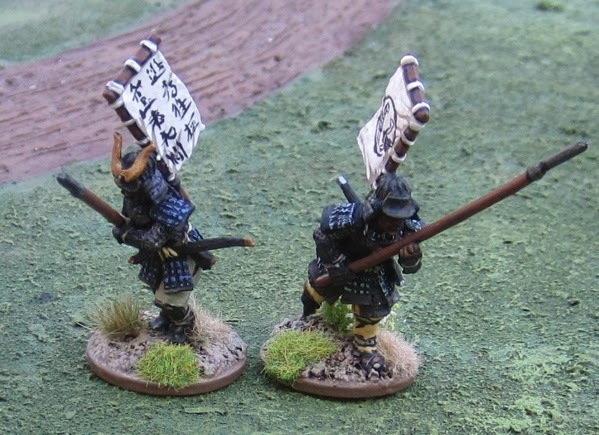 A Bandit archer grievously wounded the Lion Samurai. 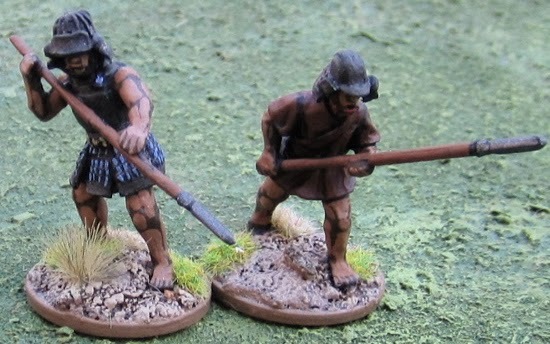 Lion and Bandit archers were wounded by arrows. 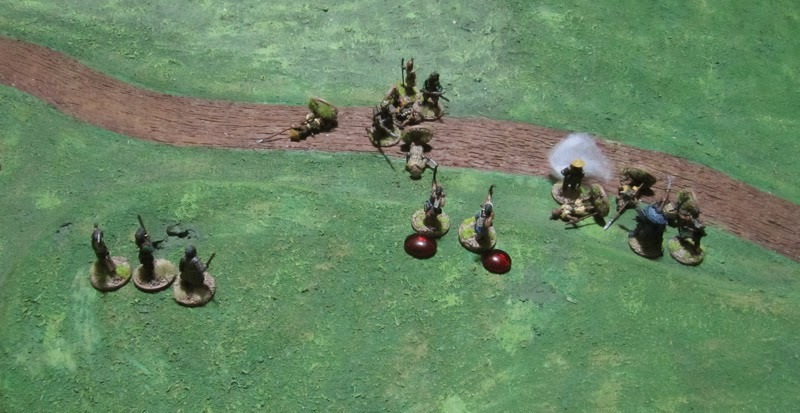 At this point we wondered if, in the campaign, it might be a good time for the Lion to pack it in and concede – it looked like it was going badly for them – two ashigaru dead, one wounded and the samurai grievously wounded….? 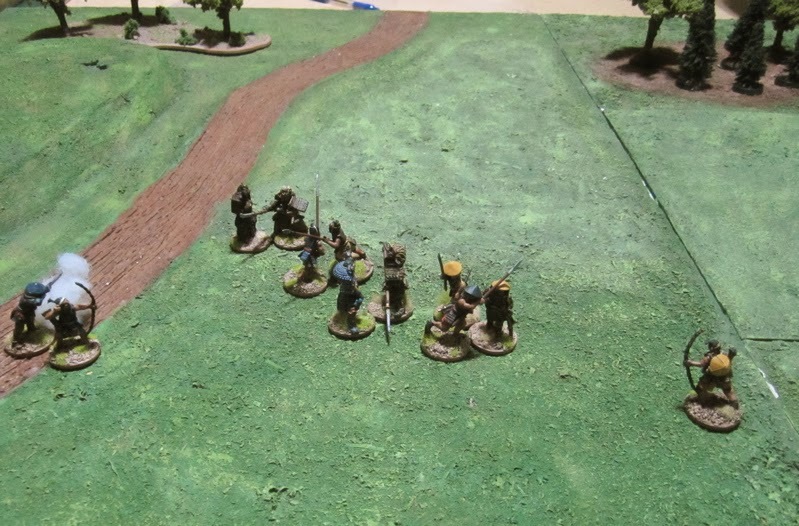 Turn Four – The Lions passed their morale test and we carried on… The teppo armed Lion Ashigaru charged in to fight a peasant. 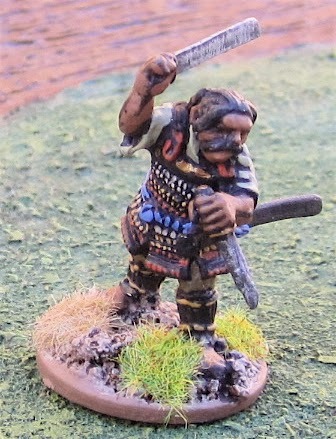 The Bandit leader and one of his bandit underlings charged in to fight the grievously wounded Lion Samurai. 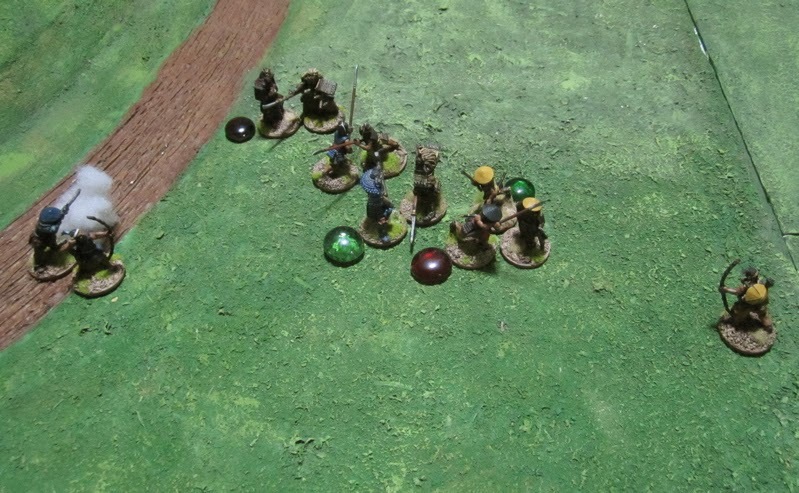 A peasant charged in to distract the Lion Bushou, while a gashira and another peasant attacked the Lion ashigaru archer. 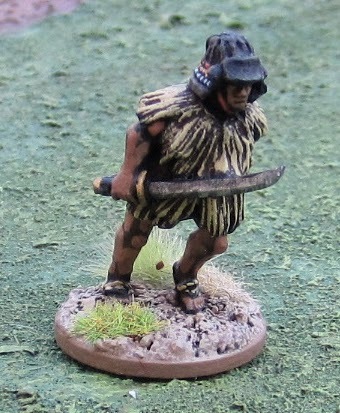 Peasants were slain by the Bushou and the Ashigaru with the teppo (and the Bushou collected his first head!). 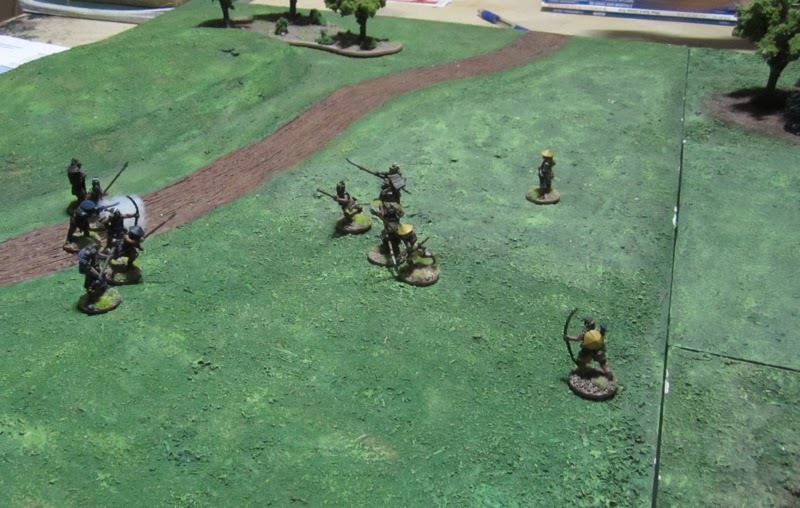 The Lion Samurai and Ashigaru archer also met their ends… (and the bandit looted the Samurai! I need to come up with better “loot counters” I just gave the bandit a treasure chest I had kicking around – which looked a bit silly…). 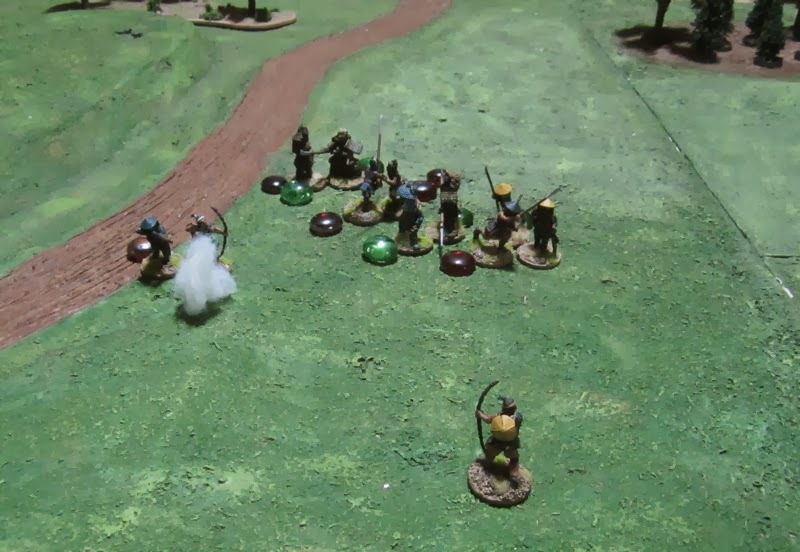 The next round (Turn Five), however, the Bushou charged up the hill engaging BOTH archers up there. The Bandit leader charged into that mess, but the remaining Lion ashigaru charged him to take the pressure off his Bushou! A Bandit archer joined the Bandit leader, and a Bandit Gashira and Peasant joined the fight against the Bushou. I got a little caught up in the game and forgot to take pictures of the results of the round and the following one, but, if I remember correctly one Turn Five the Bushou slayed the two Gashira, and the bandit archer – only the peasant remained! 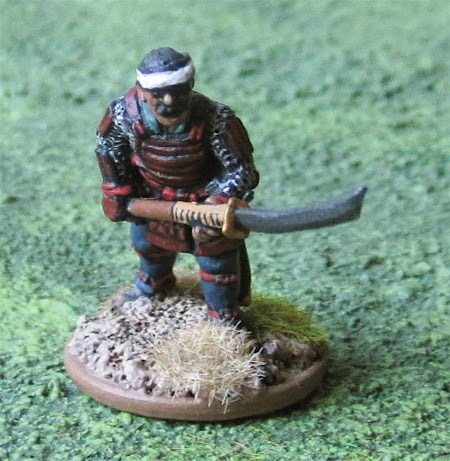 The Bandit leader , with the aid of one of the bandits took down the remaining Ashigaru. 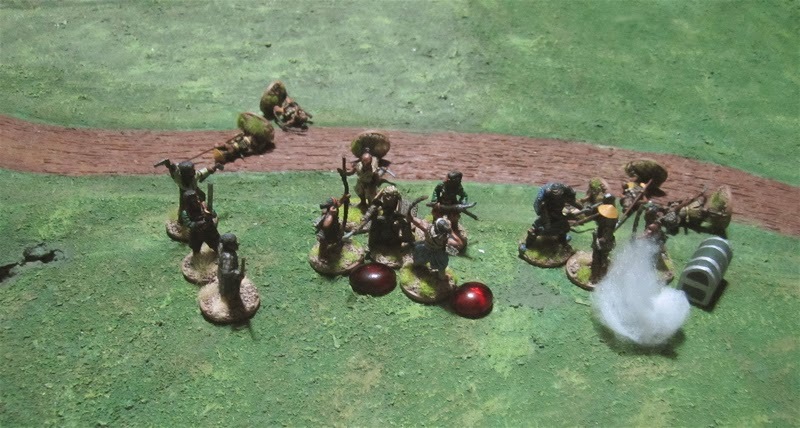 Turn Six – The bandits passed their morale check, then everyone stood off and watched the Bushou slay the remaining peasant in contant and collect his head. 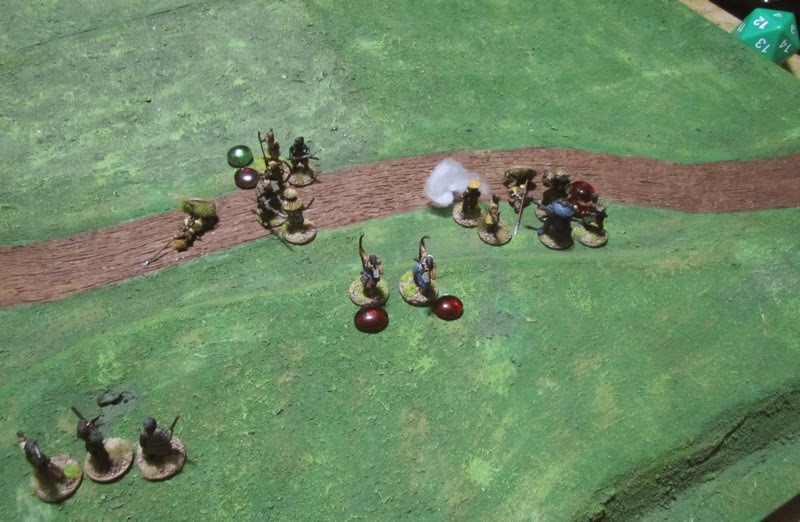 The remaining bandit archer took some shots at the Bushou, lightly wounding him. Turn Seven. The Lion Bushou charged and attacked the Bandit Leader, a Gashir and two peasants came to his aid, but it was no use. The Bandit leader was slain…. and that was the end of the game. 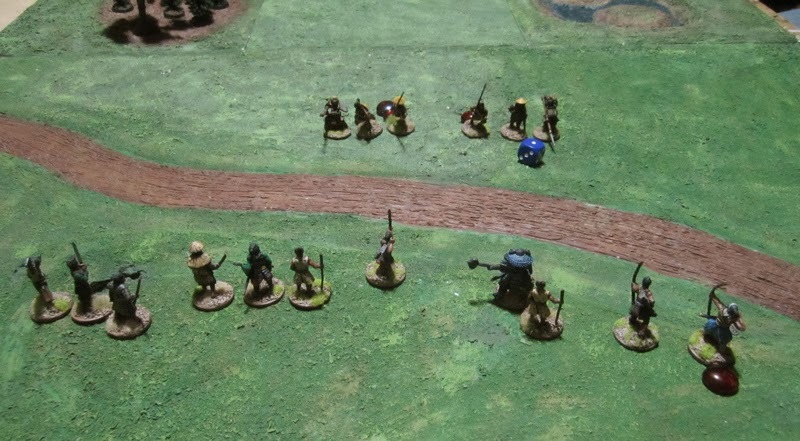 The Bandits scored 8 victory points; 3 for the samurai, 1 for each of the Ashigaru, and 1 for a surviving bandit that looted the samurai. The Lions scored 11.5 victory points! 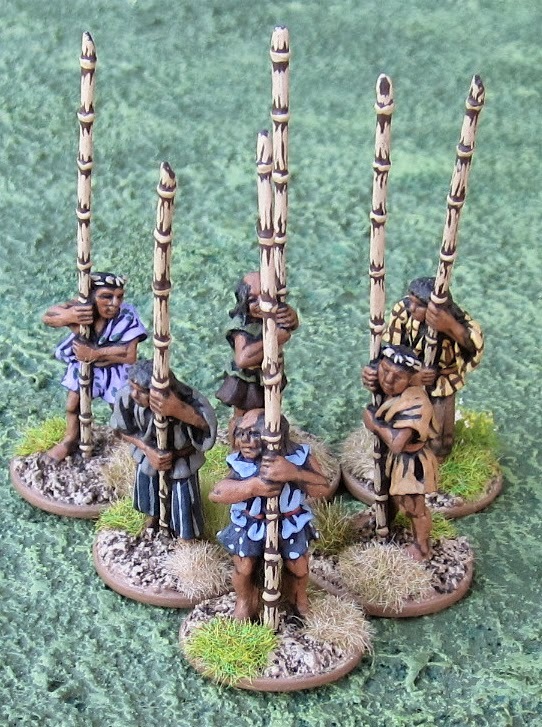 3 for the Bandit leader, 2 for each of the two Gashira, one for the bandit archer, 1.5 for three peasants, and 2 for the two heads collected! A Lion victory – but at a cost!! They lost 102 points worth of stuff – that would be a quarter of their full roster for the tournament in one game! 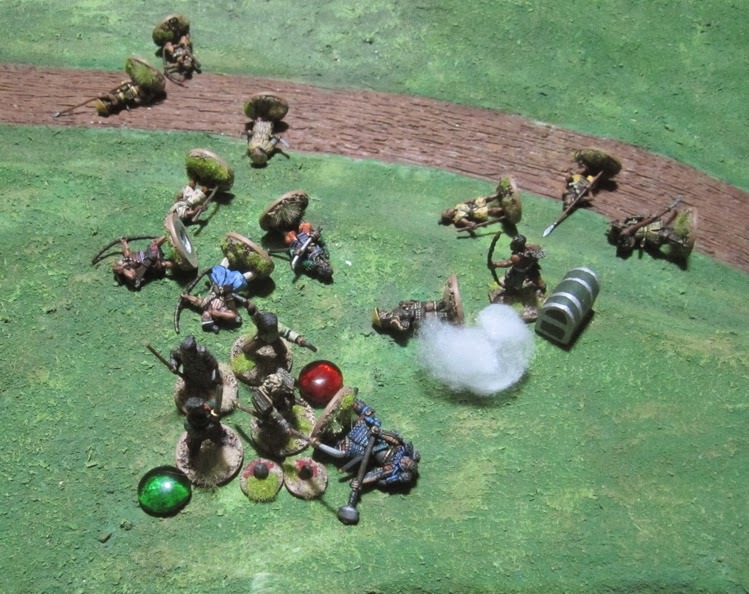 The bandits were beaten down pretty hard too – losing 92 points themselves and their leader! 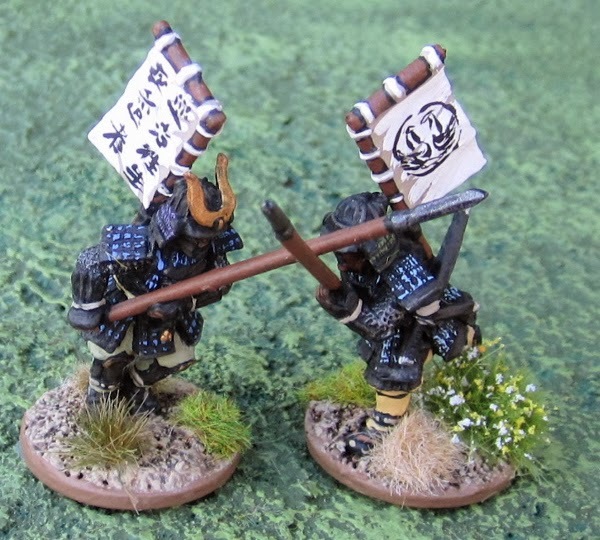 I think the bandits need to play a bit more of a cagey game against the hard hitting, well armoured Bushi – keeping their distance and shooting and NOT letting the bushou get into contact with the leader or gashira! Another fun game – lots of tension - could have gone either way! 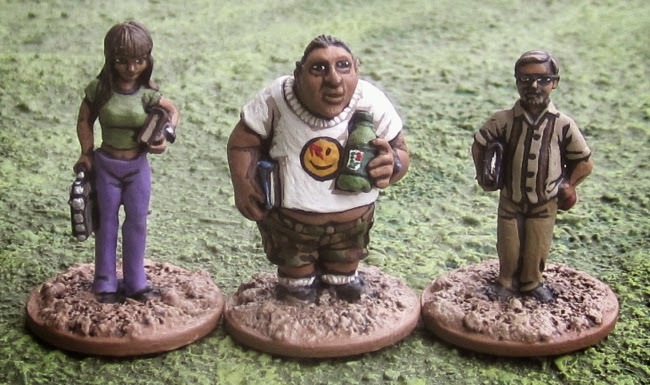 Ummm… I haven’t been painting much the last day or so… hopefully I’ll get back on that over the next couple evenings and have another buntai or two finished up over the next week.